This centre aims to design and manufacture the next generation of lightweighting solutions in response to the significant challenges facing the UK and global transportation industry as a result of the low carbon agenda. It builds upon a 10 year track record in delivering such solutions to industry through a series of TSB, AWM and ERDF funded collaborative R&D projects. 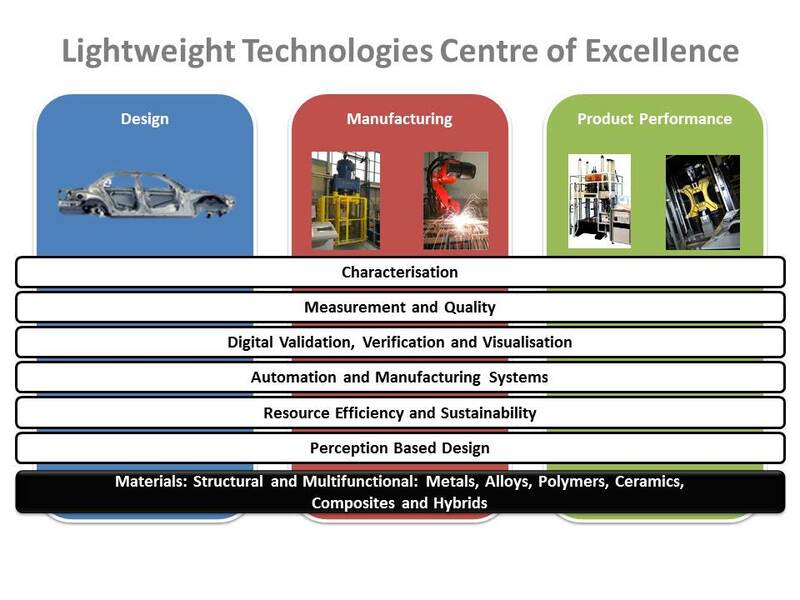 The research has three themes namely: design; manufacture (forming & shaping and assembly); and product performance with a number of cross cutting themes as shown in figure 1. It is materials agnostic covering structural and functional materials including metals, ceramics, polymers, composites and hybrids. The primary application focus is in automotive addressing the UK Automotive Council Lightweight Structures and Powertrain R&D priority however we work with our rail and aerospace/defence partners to identify and exploit cross-sector opportunities. The key challenges below address a need not only in the automotive sector but also in the rail and/or aerospace/defence industries. Good design is key enabler for lightweighting however the design tools used today are sub-optimal and a new generation of high fidelity multi-physics simulation tools need to be developed to enable light weight structures. Mass customisation is becoming increasingly important to the buying public and new technologies (such as ALM) can facilitate this however new thinking is required about how this can be achieved and integrated into a mass production line. A significant proportion of the materials that a customer actually experiences in a structure are those used for cosmetic purposes and there are many opportunities for enhancing the customer experience whilst taking weight out of these materials. As we introduce new materials into structures new design opportunities will become available and developing an understanding customer acceptance of these new materials, designs and technologies is required. Currently over 99% of vehicles on the road are steel intensive vehicles. The UK is a centre of excellence for lightweight structures with companies such as Jaguar LandRover being world leaders in aluminium intensive vehicles. At present aluminium technology is limited to the premium and niche sector. Much work is required to transfer this technology to the volume manufacturers and to increase the adoption of higher strength aluminium alloys, advanced ultra high strength steels, and other metallic materials such as magnesium. This leads to challenges in both forming and joining, a requirement for new manufacturing systems, and the development of expert systems to inform and assist designers (design for manufacture). The UK leads Europe in the design and manufacture of advanced powertrain with significant inward investment in new manufacturing plants for conventional powertrain as well as R&D spend on alternative options such as hybrid/electric. Significant lightweighting is required to increase the energy density to make these alternative powertrain systems a viable and sustainable alternative. New manufacturing paradigms are required to not only manufacture these powertrains but also to incorporate them into a production line that will be delivering a combination of products ranging from conventional to hybrid to fully electric. The next 10 years will see a further revolution in the materials used in automotive structures with a move to polymer composites and multi-material structures. Current aerospace technology cannot deliver these polymer composite components at a price or production rate that is compatible with volume production. Significant issues need to be addressed: development of high speed curing technologies and equipment; joining (both heterogeneous and homogeneous); high strain rate behaviour of materials and assembled components; and development of materials models for forming, joining and performance simulation. The increased use of polymer composites will open up opportunities for introducing multi-functionality (i.e energy storage/harvesting, electrical integration, vibration control) both at a systems and material level. This will link into the drive towards smart and connected vehicles, the increased integration of IT into vehicles and the development of advanced and fully integrated HMI solutions. This will see an increased use of nanotechnology/composites with the associated design, manufacturing and performance challenges this brings. There is also the potential for embedding telemetry sensors that can not only be used to inform service operations but also allow for design based on real life data and reduced safety margins.